Nexus 5 in 2015 has not yet been published, but already his crown the fastest phone stole an unknown device from Samsung. A device that carries the SM-G8508S appeared on AnTuTu test and put incredible result of 95,972 AnTuTu points, which is dramatically higher than the current device. 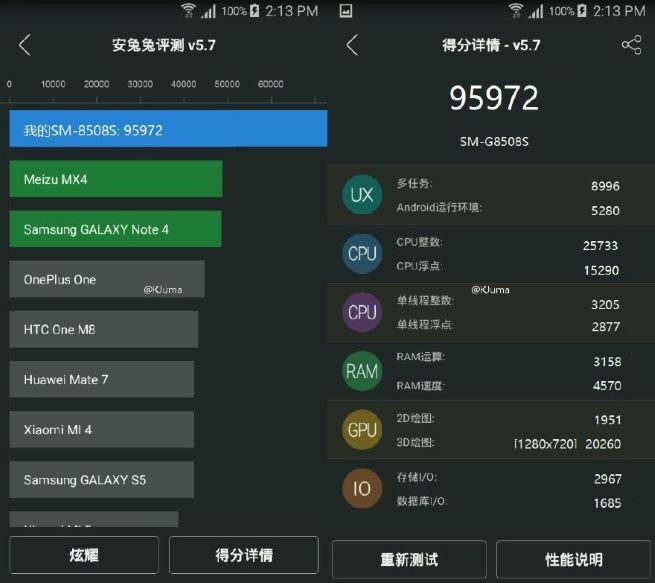 What is the difference comes, you will know if you know that Note 5, which has yet to reach the market accounting for more than 69,000 AnTuTu points. For now it is not known whether this mysterious device phone or tablet, but it is assumed that this is a prototype Galaxy S7 models codenamed Jungfrau and that raises another unknown Exynost chipset.